A guide for Arena of Valor's Maloch, The Ravenor. Maloch swoops into the enemy's team to initiate team fights before shielding himself and ravaging them with his gigantic sword. 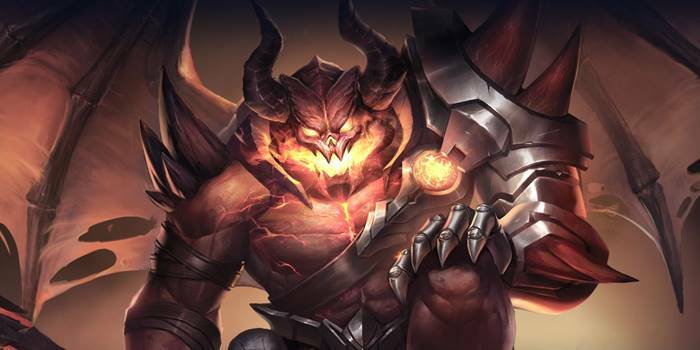 Maloch is warrior/tank hero who is widely known as one of the most intimidating heroes in Arena of Valor. A giant demon wielding a tremendous sword, Maloch can quickly swoop down on enemies with Shock and deal a huge chunk of damage due to Plunder. He can also turn an outnumbered fight to his team’s favor with his sustain and engaging ability. High Damage Output – Maloch’s abilities deal a ton of damage with the help of Plunder. Landing Cleave will deal AoE true damage while restoring some of his health. He also has a longer range than other melee heroes, making him great at harassing enemies during the laning phase. Good initiator – His ultimate, Shock, can knock up and slow enemies inside a huge area of effect. This makes Maloch a great initiator in team fights. All of his other abilities also have large areas of effect, making him a valuable asset in team fights. Can Win Fights Even When Outnumbered – Maloch can help his team through fights even when outnumbered. His large damage output, thick defenses, shields, and regeneration make him extremely hard to tear down. Low Mobility – Maloch has no reliable movement ability aside from Shock, which can easily be cancelled with control abilities. This gives Maloch little to no chance of escaping critical fights, especially against mobile heroes. Long Cooldown on Ultimate – Shock is a very powerful initiating tool that can quickly turn team fights in your favor. However, the ability has a very long cooldown which may keep Maloch from having it available when needed. Take advantage of your passive and harass the opponent. You want to be able to harass enemy melee heroes rather than ranged ones, as long-range heroes can kite Maloch. Hitting an enemy hero with Cleave grants a small time period where your next use of Cleave deals true damage and restores some HP. Do not use Souleater to harass enemy heroes as it does not deal much damage. Only use Souleater when you want to go all-in or need the extra shield during a team fight. Cleave is your go-to ability and will be your main damage dealer throughout the game. This ability will also enchant your sword for your true damage passive. Max this one first. Souleater is also a strong ability, but maxing it first is not recommended unless you think you really need the shield. This is unlikely, so Souleater can be saved for later. Ganking – As Maloch, your main goal is to initate team fights with Shock. Hide in the bushes to surprise your enemies when you cast the ability. Do take note that this ability can be cancelled if Maloch is stunned, so be careful and avoid using it in the middle of a team fight. Solo Battle – Always try to hit with Cleave so that you can enchant your sword and deal extra damage. It’s also important to use Souleater when the enemy is retreating or dealing a lot of damage to you. Team Battle – Team fights are where Maloch thrives. After casting Shock, try to hit as many heroes as possible with Souleater. This allows you to get the biggest shield possible. Focus on hitting squishier targets with your enchanted sword. Use Souleater on groups of enemies for the largest shield possible. Escaping Fights – Maloch doesn’t have that many options when escaping fights. Using Shock to get out is a bad idea as it can be interrupted by crowd control. The best option would be to use Souleater to slow down the enemies who are chasing you and shield yourself from their attacks. Plunder – Maloch has a longer attack range than other melee units. When his weapon is enchanted, his normal attacks deal 170 true damage instead of physical damage and restore 2% of his lost HP (+0.15 additional AD bonus). As this gives Maloch true damage, it makes him capable of slicing through a tank’s defenses. The only way to enchant Maloch’s sword is to hit a champion with Cleave. The enchantment lasts for around five seconds before disappearing. True Damage attacks do not benefit from life steal. Towers are affected by True Damage, making this a good tool in knocking them down. Cleave – Maloch swings his blade and deals 370/480/590/700/810/920 (+1.8 AD) physical damage. If he hits a hero, his weapon becomes enchanted. When his weapon is enchanted, Cleave will deal true damage and recover 6% (+0.3 additional AD bonus) (up to 24%) of his own lost HP for every hero it hits. Being stunned after casting Cleave will not cancel it, despite its long animation. Maloch can move while casting Cleave. A common tactic is to step forward as the blade swings and immediately back up in order to harass enemies. Hitting an enemy with Cleave while enchanted refreshes the enchantment. Souleater – Maloch snatches the souls of the surrunding enemies, dealing a small amount of physical damage and reducing their movement speed by 30% for 3 seconds. He gains a shield for snatching souls, absorbing up to 600/800/1000/1200/1400/1600 (+2.8 AD) damage taken with 4 snatched souls. This ability is very effective against opponents who are grouped together, as the more enemies affected by Souleater, the bigger Maloch’s shield will be. This ability is powerful when used defensively. When escaping an enemy, make sure to use this before running in order to slow them down and protect yourself. This ability is not recommended for harassing enemies, as it only deals a small amount of damage. It is best used in team fights. Shock – Maloch unleashes a massacre from above at the specified location. He knocks nearby enemies when he lands and deals 420/525/630 (+1.2 AD) physical damage. Also reduces movement speed of any enemy that tries to enter or exit the zone. This ability can be cancelled by crowd control when charging, making this a very risky ability to use to escape. It’s better if you use Souleater to slow enemies who are chasing you. Maloch is vulnerable to kiting, so marksmen and mages can be a good way to deal with a Maloch who is starting to snowball. In a team fight against Maloch, don’t stay too close to your allies. His abilities work best when targets are close together and offer him the most survivability. When wanting to build up Maloch’s damage, sets of Onslaught, Assassinate, and Skewer are some of his best options. A tanky arcana build can also suit Maloch well. Running Indomitable, Undying, and Bastion allows him to be much more effective in the frontline. Maloch can deal with tanks since Plunder allows him to cut through their defenses. That said, they aren’t high priority targets and should generally be ignored in favor of damage dealers. As an additional pain, their crowd control can be used to disrupt Shock, which isn’t fun at all. Maloch can deal with warriors in team fights but will have a harder time one on one. Harass the warrior with Cleave, taking advantage of your longer range to safely harass them. Don’t let an assassin get the upper hand in a fight and always have Souleater ready for when they jump you. Act quickly when engaged and retaliate with Cleave. You can also cast Shock either away from or on them as most assassins do not have any stuns or knock ups to cancel your ultimate. One on one, Maloch will be at a heavy disadvantage against assassins. You can easily kill a mage if you are able to get close. Unfortunately, this can be rather difficult, depending on the mage, many able to kite him from afar. Go for them with Shock in team fights to quickly close the distance and prevent them from kiting you. Be careful when engaging marksmen because they can kite you if you get within their range. It’s a priority to hit them Souleater and Cleave in order to keep them within your own range. Supports are not a priority for Maloch, but can be an easily killed when they are alone. In team fights, it’s best to just stay away from them. As a warrior/tank, your priority is to kill carries first.